Upon meeting a Christian Brother one day in the marketplace, Pierre Romançon, aged 13, immediately decided to become a brother. He enrolled at the Brothers' school over the objections of his father. Despite the impediment of his diminutive height, he was admitted to the novitiate at Clermont at the age of 14 and took the name Brother Benilde. He is remembered for his extraordinary gifts as a teacher, as well as for his holiness and generosity. 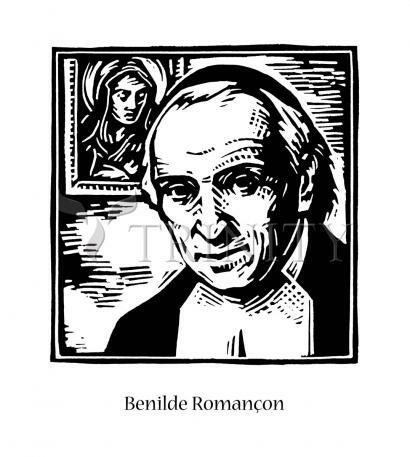 "Brother Benilde's extraordinary religious sense was evident to everyone: at Mass with the students in the parish church, teaching catechism, preparing boys for first communion, visiting and praying with the sick, and rumors of near-miraculous cures. He was especially effective in attracting religious vocations. At his beatification, Pope Pius XII stressed that his sanctification was attained by enduring 'the terrible daily grind' and by 'doing common things in an uncommon way.'" His feast day is August 13. Pierre Romançon was born in the village of Thuret in south-central France. He was so far ahead of his classmates in elementary school that when he was only fourteen years old the Brothers engaged him as a substitute teacher. Despite the objection of his parents, who wanted to keep him at home, and the reluctance of the superiors, who thought he was too short of stature, he was finally admitted to the novitiate. From 1821 to 1841 he taught successfully in the network of elementary schools conducted by the Brothers out of the administrative center at Clermont-Ferrand. In 1841 he was appointed Director of a school that was opening in Saugues, an isolated village on a barren plateau in southern France. For the next twenty years he worked quietly and effectively as teacher and principal to educate the boys in the village and some from the neighboring farms, many of whom were in their teens and had never been to school before. Small as he was, he was known as a strict but fair disciplinarian. In time the little school became the center of the social and intellectual life of the village, with evening classes for the adults and tutoring for the less gifted students. Brother Benilde's extraordinary religious sense was evident to everyone: at Mass with the students in the parish church, teaching catechism, preparing boys for first communion, visiting and praying with the sick, and rumors of near-miraculous cures. He was especially effective in attracting religious vocations. At his death were more than 200 Brothers and an impressive number of priests who had been his students at Saugues. At his beatification, Pope Pius XII stressed that his sanctification was attained by enduring "the terrible daily grind" and by "doing common things in an uncommon way."